My friend Courtney and I went to dinner at Homegrown Pizza in Holly Springs this week. When we pulled up to the restaurant, we were slightly confused. You have to walk through what looks like an office building before actually reaching the restaurant. So when you visit make sure you follow the flashing beer signs and smell of pizza. We sat down in a comfortable booth and noticed the restaurant was packed with locals. Make sure to get there early if you want a table during dinner; Homegrown Pizza is relatively small. Soon my attention was drawn from the numerous families and groups of friends to the pizza. The crust was bubbly, and the aroma of the pizza passing by our booth was incredible. The pizza dough and marinara sauce are prepared every day in the restaurant. The produce used for the pizzas and salads is delivered to the restaurant by Papa Spud’s, an online farmers’ market connecting people and restaurants to local and sustainable farmers. 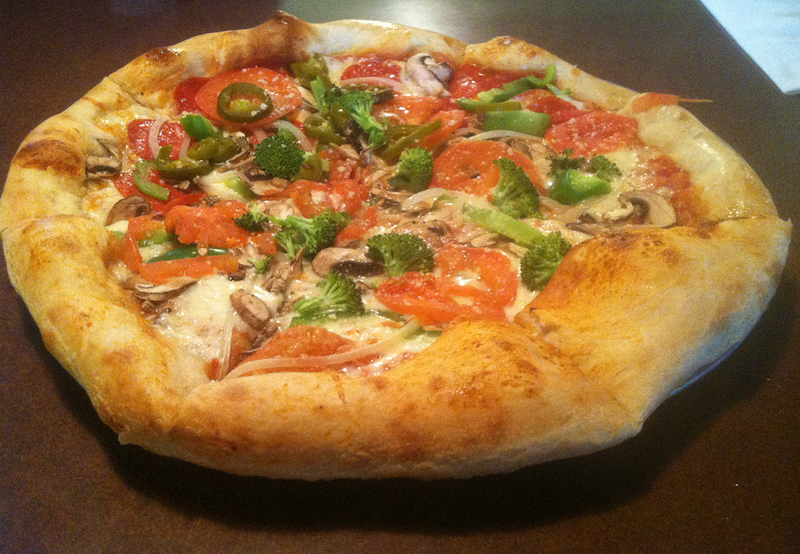 Papa Spud’s delivers fresh food right to Homegrown Pizza’s kitchen, hence their pizza is “homegrown.” Courtney and I decided to order a custom veggie pizza, which was topped with mushrooms, onions, green peppers, tomatoes, broccoli and mozzarella. Courtney also added pepperoni and jalapeños to her half of the pie. We eagerly waited in anticipation for our pizza. Every time a pizza passed by our booth, my stomach growled even louder! The veggie pizza came out to our table within about 10 minutes. I thoroughly enjoyed the pizza, and my favorite part was the crust. After taking the first bite of pizza crust, I was on cloud nine. The crust was airy, golden brown and crispy on the edges. The produce was fresh and tasted fantastic with the homemade marinara sauce. I also appreciated that Homegrown Pizza doesn’t drench their pizza with sauce like some pizza places. Not only does Homegrown Pizza offer tons of specialty pies, they have an extensive menu with salads, sandwiches, calzones, wings and typical bar food. The atmosphere is laid back and would be a great place to watch a game. There’s a small bar with beers on draft and lots of flat screen TVs. I would definitely go back to this pizza joint soon to order a margherita pizza and hang out with the Holly Springs locals.